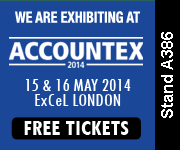 Accountex is the only national exhibition in UK for financial professionals, that provides expert insight and education within a live environment. The show debuted in November 2012 and they are supported by UK’s most important accountancy associations. DataTracks will exhibit in booth number A386 at the conference and will provide insight to prospective clients about the iXBRL managed tagging services offered by DataTracks. DataTracks iXBRL tagging service can be used by companies and tax accountants who do not wish to invest in an iXBRL tagging and tax preparation software or in an accounting and technical expertise required to prepare iXBRL documents. Our service helps companies and tax accountants focus on their core business and save on time and money. At DataTracks, the financial accounts and tax computations are converted in iXBRL format from inputs which are uploaded by the customer through the website of DataTracks. The input files can be provided as spreadsheets, word processor documents or PDF files. DataTracks has experts who are trained in UK GAAP, IFRS and iXBRL technology. The Financial Reporting Council (FRC) in the UK has published three standards which form the basis of the new UK GAAP and is applicable in the UK and Ireland. This framework will be effective for accounting periods beginning from 1st January 2015. FRC has also permitted using the new standards for accounting periods ending on or after 31st December 2012, provided that there is no conflict with the requisites of the present SORP (Statement of Recommended Practice). DataTracks UK is one of the earliest providers of iXBRL managed tagging services to receive HMRC recognition for converting financial statements and tax computations to iXBRL format. DataTracks is also the first to be accredited by ICAEW. From accounting firms to group companies to small businesses, DataTracks offers a convenient and secure option to prepare their financial statements into iXBRL format for HMRC filing. About DataTracks: DTracks Limited is a subsidiary of DataTracks Services Limited (www.datatracksglobal.com). With more than 8 years track record, DataTracks is a global leader in preparation of financial statements in XBRL and iXBRL formats for filing with regulators. DataTracks prepares more than 12,000 XBRL statements annually for filing with regulators such as SEC in the United States, HMRC in the United Kingdom and MCA in India.